↑ Procter-Gray, E. & Gansiosser, U. (1987). 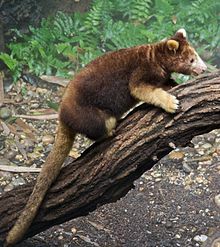 "The individual behaviors of Lumholtz's Tree-Kangaroo: Repertoire and taxonomic iTree-kangaroosmplications". Journal of Mammalogy. 67 (2): 343–352. डीओआइ:10.2307/1380888. अभिगमन तिथि 25 October 2013.